We have focused our current effort on the Transportation Index, the US Majors, and the Metals Markets. The Transportation Index has seen an extensive rally (+19.85%) originating near November 2017. This incredible upside move correlates with renewed US Tax policies and Economic increases that are sure to drive the US Equity market higher throughout 2018. In theory, the Transportation Index is a measure of economic activity as related to the transportation of goods from port to distribution centers and from distribution centers to retail centers. The recent jump in the Transportation Index foretells of strong economic activity within the US for at least the next 3 months. 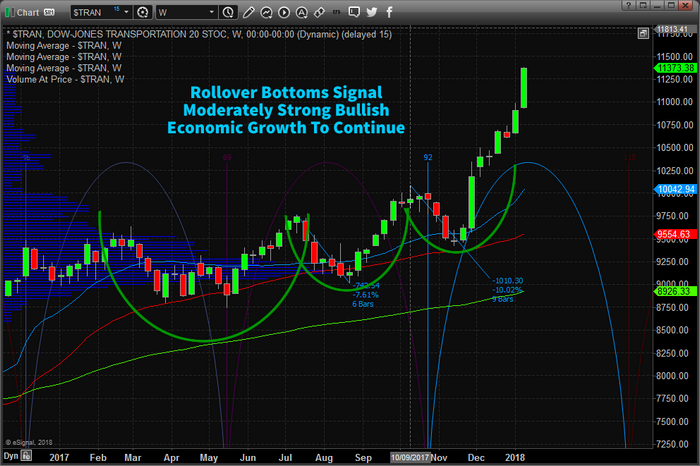 One could, and likely should watch the Transportation Index for any signs of weakness or contraction which would indicate an economic slowdown about to unfold. In order to better understand how the Transportation Index precedes the US Equity markets by 2~5 months, let’s compare the current price activity to that of 2007~08. This first chart is the current Transportation Index and shows how strong the US economic recovery is in relation to the previous year (2017). As the US economy has continued to strengthen and open up new opportunities, the Transportation Index has related this strength by increasing by near +20% in only a few short months. This shows us that we should continue to expect a moderate to strong bullish bias for at least the first quarter of 2018 – unless something dramatic changes in relation to economic opportunities. In comparison, this chart (below) is the Transportation Index in 2007~08 which reacted quite differently. The economic environment was vastly different at this time. The US Fed had raised rates consecutively over a two year period leading up to a massive debt/credit crisis. At the same time, the US had a Presidential Election cycle that saw massive uncertainty with regards to regulation, policies and economic opportunities. Delinquencies as related to debt had already started to climb and the markets reacted to the economic alarms ringing from all corners of the globe. 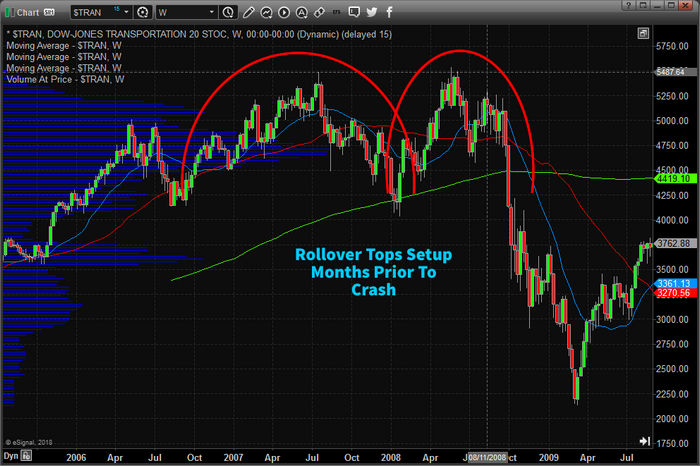 The Transportation Index formed a classic “rollover top” formation in late 2007 and early 2008 well before the global markets really began to tank. Our analysis points to a very strong first quarter of 2018 within the US and for US Equities. We believe the economic indicators will continue to perform well and, at least for the next 3 months, will continue to drive strong equity growth. We do expect some volatility near the end of the first Quarter as well as continued 2~5% price volatility/rotation at times. There will be levels of contraction in the markets that are natural and healthy for this rally. So, be prepared for some rotation that could be deeper than what we have seen over the last 6 months. In conclusion, equities are this point are overpriced, and overbought based on the short-term analysis. We should be entering slightly weaker time for large-cap stocks over the next couple weeks before it goes much higher. Because we are still in a full out bull market, Dips Should Be Bought and we will notify members of a new trade once we get another one of these setups.